Discover how we built a lead generation campaign around a core theme that generated over 1600 e-guide downloads. Why should you choose a core theme for your lead generation campaigns? A clear and consistent campaign theme helps prospects quickly understand your value proposition and content. Discover how we developed an inbound campaign centered around a core theme for decision-makers in the HR industry and generated more than 1600 content downloads for Visma Enterprise Denmark. Visma is Europe’s leading cloud software provider, developing solutions to make people work smarter. Visma Enterprise Denmark provides Human Resource Management (HRM) solutions to Danish organizations, simplifying HR and payroll administration. Visma Enterprise Denmark decided to team up with Brightvision and utilize inbound tactics to position Visma Enterprise Denmark as a thought leader, generate awareness and at the same time generate new leads. Visma Enterprise Denmark wanted to reach both decision makers (primarily CFO's) and the people who use their products on a daily basis, primarily HR professionals and payroll administrators. The primary purpose of the inbound marketing campaign was to generate new leads outside of the existing customer base. Visma Enterprise Denmark came to Brightvision with a loose idea of creating a campaign around a new vacation law that would soon come to Denmark, affecting all Danish employers and employees. This was a great opportunity for Visma Enterprise Denmark to promote their HRM solution, which naturally could make the adaptation of the new vacation law smoother and more efficient. Brightvision’s objective was to create an inbound marketing campaign with focus on the new vacation law. Visma Enterprise Denmark wanted the campaign to position them as a thought leader when it comes to employment legislation and generate new leads, both decision makers and daily users, outside the existing customer base. Brightvision created an inbound marketing campaign, with focus on the new vacation law. The entire campaign was centered around one piece of Big Rock content – an E-guide for the new vacation law. 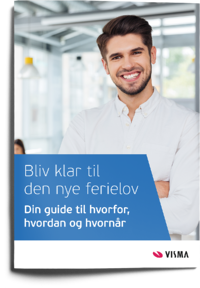 The E-guide was created to cater to the needs of both decision makers and daily users of Visma Enterprise Denmark’s HRM solution. By creating a customized nurture email flow and filling it with several pieces of valuable content, we strategically drove the lead down the funnel and closer to a purchase decision. The paid promotion of the campaign alone resulted in 161 389 impressions and in total we generated 1687 leads. After the campaign, Visma Enterprise Denmark’s had been positioned as an expert by creating engaging and educational content, and at the same time generating many new leads for the sales team to handle. The campaign’s main goal was to generate new leads for Visma Enterprise Denmark. To create a successful inbound marketing campaign, we had to provide the right content to the right people, at the right time. To do this, we worked according to Brightvision’s carefully structured process. Our process can be broken down into five phases; campaign strategy, campaign structure, premium content, campaign promotion and evaluation. All successful campaigns start with research and audit. Through two workshops, we asked all questions we needed answers to, in order to create a well-planned campaign strategy. We mapped out three buyer personas this campaign would target and created a full campaign strategy, designed for Visma Enterprise Denmark’s specific needs. During the start-up phase, we also set the timeplan for the campaign, as well as decided on all parts of the campaign. 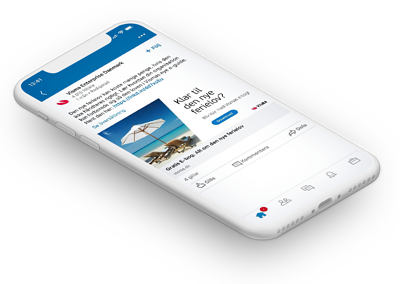 The campaign would focus on the new vacation law, attract all three personas, generate content downloads and nurture leads closer to a purchase decision. When the campaign and all parts of it was planned, it was time to produce the campaign. The first thing to do was to create the structure of the campaign. The structure consisted of landing pages, emails, configuration of marketing automation and technical setup. Two sets of landing pages and thank you pages were created, in Visma Enterprise Denmark’s existing systems. The two versions had different messaging, to fully engage all three personas. We connected the landing pages to a sophisticated marketing automation system to capture as much information as possible about each person who downloaded our content. We set up the pages so we could analyze important statistics such as visitors, time on site, bounce rate and other. We also created an automated email workflow, to drive leads down the funnel, and to increase their inclination to convert to a customer. We created six emails in total, and the nurture flow was set up with reminders and time delays, designed with the personas’ behavior in mind. After setting up all emails and landing pages, it was time to fill the campaign with premium content. The most important part of every inbound campaign is content the persona find interesting, valuable and engaging. As part of the campaign strategy, we built the entire campaign around one piece of Big Rock content – an E-guide to the new vacation law. The E-guide catered to all three personas, and was made available for download on the two landing pages. The email flow was also filled with content of value on the same topic as the E-guide. This included a handy checklist over the new vacation law and a blog post on the subject. The blog post also worked as a driver of organic traffic and was published on Visma’s blog. As with all inbound marketing campaigns, the promotion was a key phase of the campaign. The campaign was promoted in several different channels. In line with inbound tactics, the campaign was promoted both organically and with paid media. We created a media plan for when and how the campaign would be promoted. The media plan set the division of ad budget, how we would target the three personas and when organic posts would be published. The paid promotion was a mix of paid promotion on social media and programmatic advertising. This powerful combination, with added remarketing to website visitors, ensured us we would make Visma Enterprise Denmark top of mind and that we reached the target audiences at the right place, at the right time. During the promotion phase, we also put a lot of effort in measuring, reporting and optimizing. This was continuous work throughout the entire campaign promotion. For all our campaigns, we rely heavily on the measurable results, since this is what the campaign is all about, all things considered. Monitoring the performance of the promotion, allowed us to make the necessary tweaks to make good results better. And with an average CTR on 1.11%, and 1687 content downloads, we beat both industry benchmarks, as well as the KPI’s set in the initial workshops. When the campaign ended, we took a deep dive into the measurable results of the campaign. By looking at the numbers, we could analyze all campaign parts, and getting a better understanding of the target audience, the content created and what the optimal next marketing step would be. In the end, the only two things we care about is; A) whether the purpose of the campaign was fulfilled, and B) whether our client is satisfied. The Vacation law inbound campaign was a success in both these regards. The campaign utilized premium content delivered to the right people at the right time, positioning Visma Enterprise Denmark as a thought leader, generating new leads and more than 1600 content downloads..
At the end of the campaign, Visma Enterprise Denmark decided to extend the campaign and work more with Brightvision. This was a clear sign that the campaign was a success.